Female burrows through skin (finger webs, elbows, wrists). 2-3 eggs per day in burrow (for up to 2 months!). Larvae emerge 3 days later. Live cycle complete in 10-14 days. 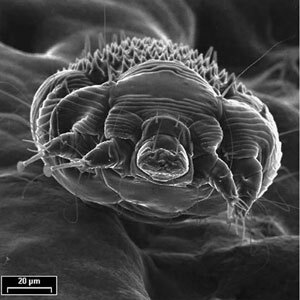 Mites live circa 30 days. Incubation period (1st) 2-4 weeks - allergic reaction develops to mite faeces. Hands,(finger webs), wrists, elbows, male genitalia, buttocks, axillae. ID burrow with mite at one end (good light, magnifying glass). 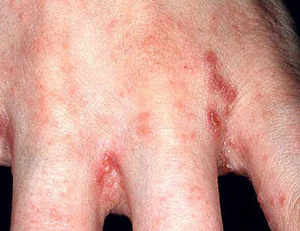 Crusted ("Norwegian") scabies found in elderly, alcoholics, Down's syndrome, AIDS, immunosuppressed. Oral antihistamines (itch) if required. Household contacts treated AT SAME TIME. Two treatments, one week apart. Anybody else at home got itch? 80% of males have genital involvement. No head / neck involvement as too cold. Don’t look for burrows treat on Hx alone. GP to refer dermatology if fails.